The ?Buy Nothing Week? 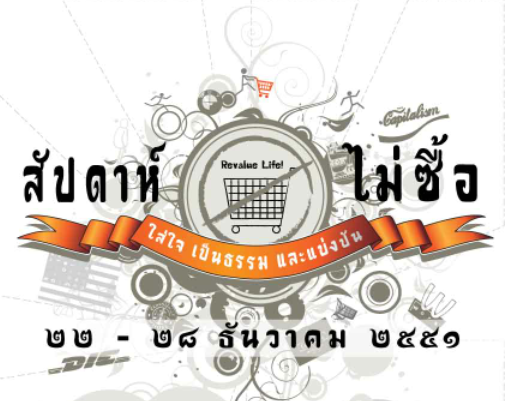 campaign was held on 28th January 2008 and lasted until 2nd February 2008 in Thailand. It is the week of challenging ourselves to buy less and get to know ourselves how much we addicted to buying things, and find alternative ways other than shopping to happiness and good lives. The concept of the ?Buy Nothing Week? is derived from the ?Buy Nothing Day? (BND) which first started in 1992 in Vancouver, Canada by an artist Ted Dave and his friends. Promoted by Adbusters, an international magazine, it has now at least 62 countries (recorded in 2003) joining the movement. Through the ?Buy Nothing? movement, we can help stop this shop-till-you drop culture, save environment, and eventually, promote sustainable lifestyles. Everyone around the world is invited to join. You can make any day a ?Buy Nothing Day? in any place, any country, wherever you are. You can ask your friends to do it together as a group and have fun with it. INEB is one of the major participants of the campaign and would like to encourage everyone to learn more about the movement and join us. Here are some links that provide more information and news about the movement, as well as some useful guidance that helps you throughout the process.